Gordon Ramsay; the great pretender. He used to just pretend he was a Scottish hard man, ex-footballer. Although now he’s also pretending he’s a hotel inspector, marriage guidance counsellor and a psychiatrist. 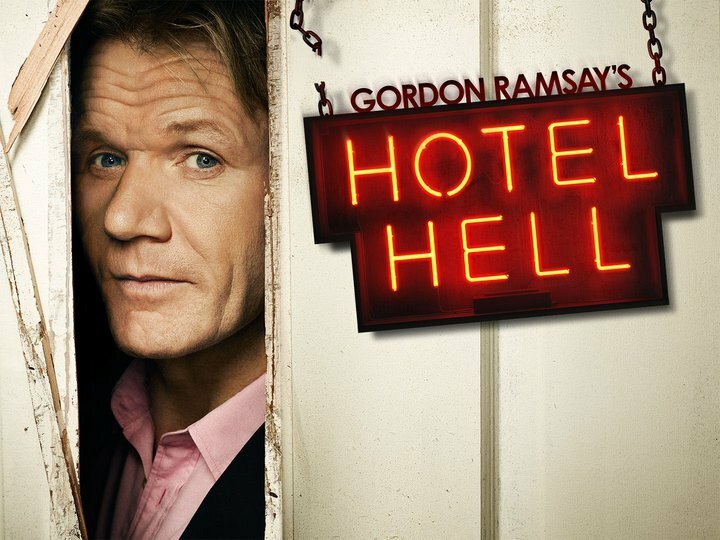 Hotel Hell sees Gordon The Moron™ attempting to salvage failing hotels. He breezes in, criticises the decor, cleanliness, the managers shoes, and finally the thing he’s actually qualified to criticise; the food. Then he breezes out again, after one painfully staged successful evening, like Mary Poppins when the wind changes. I half expected him to say ‘my work here is done’ and then float away on a multicoloured umbrella. Even worse, Ramsay is looking old. Really old, as if he is slowly melting. He looks like a fore skin with facial features. Of course, looks are not important, but this wrinkly wreck is hard to take when coupled with the fact he is an abrasive, pugnacious old Dinosaur. He talks to the owners of the hotel and their staff and bullies them into saying mean stuff about each other. This role of devil’s advocate seems sneaky and forced. Ramsay is undoubtedly excellent chef and he is strangely transfixing when he’s on a rampage, but that’s because he is so overtly aggressive. It’s like seeing a fight in a nightclub or a couple arguing in the street. You know you shouldn’t watch but it’s hard to stop. In the first episode of the third series, Ramsay comes to the rescue of a beautiful fishing lodge in the wilderness of Idaho. Despite scenic settings, foreskin face is not happy with his room, which he scrutinises carefully, unmaking his bed and complaining about the smell. This is all in front of the eager general manager who happens to be the owners son. It is toe curlingly uncomfortable to watch. When alone the room he dismantles the heating air con system in search of dust, reminiscent of Alan Partridge dismantling his hotel rooms. The owners are a middle aged couple who are stuck in a rut, professionally and emotionally (apparently). Never fear though cos Ramsay has arrived, to fix up the business and put a spark back into the marriage. (He actually says this!) How he is qualified for either of these things though is beyond me. Ramsay’s attempts at overreaching do not stop there. The couple point to the tragic death of their ten year old son years before for the downfall of the family run hotel. This is of course, fair enough. Ramsay however, upon hearing manager Dave never properly mourned his son, takes it upon himself to give the guy grief counselling in front of his hired Range Rover. It’s completely inexplicable not to mention inappropriate, especially considering that just minutes before he was effing and blinding at Dave and his family. To make it worse, the whole tragedy had pretty much been ignored by Ramsay until that point, despite it being a key factor in the failure of the hotel. The whole thing is so contrived it’s hard to take seriously. Throughout this episode rambling Ramsey attempts to get into fisticuffs, makes four people cry, destroys friendships, and in the end, actually sacks someone. Hotel hell is watchable but for all the wrong reasons. It’s hard to tear your eyes away from, much like a car crash. It’s hilarious when it’s not trying to be. Ramsay should stick to the cooking, and leave the hotel inspecting/grief and marriage counselling to the professionals. Ramsay’s Hotel Hell is on Channel 4 on Tuesday nights.